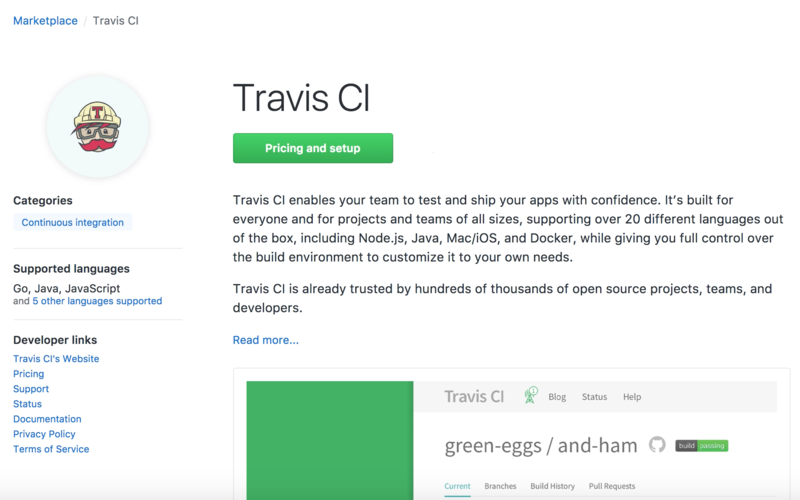 Today we’re excited to launch Travis CI on GitHub Marketplace, a new way to discover and purchase developer tools that extend your development workflow. You can find and integrate new tools—including Travis CI—into GitHub within minutes. All tools you integrate through GitHub Marketplace go through a unified billing system. For you, this means you can streamline your development process while benefiting from reduced accounting and billing headaches. GitHub has become a key platform for effective software development that goes far beyond collaboration. We’re proud of our deep GitHub integration and involvement in the GitHub ecosystem, and the way these make for a fluent user experience when building and shipping great apps to production. Travis CI was built on top of GitHub as a platform from the very beginning, and we’re excited to be an official launch partner of GitHub Marketplace. GitHub Marketplace allows us to continue this relationship with the GitHub community while giving you even easier means to add Travis CI to your development workflow within a matter of minutes. GitHub Marketplace provides a standard way to to sign up for your favorite tools in the GitHub ecosystem. To get started, go to github.com/marketplace/travis-ci. Or, navigate to GitHub Marketplace using the “Marketplace” link on your GitHub navigation bar. You will find Travis CI in the Continuous Integration section! You can sign up for a free Open-Source plan, or a plan for private projects. For private projects, select the level of job concurrency you and your team would like to use. Bootstrap (1 parallel job), Startup (3 parallel jobs), or Small Business (6 parallel jobs) plan. The Startup and Small Business plans offered on the GitHub Marketplace include an additional concurrent job than their counterparts on the travis-ci.com site. After you’ve chosen a plan, GitHub will prompt you to confirm purchase through your existing GitHub account (or perhaps add a payment method, if needed). When the process is complete, you will be asked to authorize Travis CI to access your GitHub profile with OAuth. Finally, you will be directed to your new Travis CI account page. Welcome! Now that you are all up and running, check-out out our Beginner’s’ Guide and Getting Started Guide for tips on your first build. Got any questions on GitHub Marketplace, our integration, or anything else? Drop us a line at support@travis-ci.com, we’re happy to help.